Leaving Aswan in a motor boat for Philae, an island temple. Most men outside of Cairo seem to wear the djellaba. Another early start, as usual. Today we are told to leave our luggage outside our door by 6:15 a.m. at the latest. Before we leave the boat, I have an evaluation form to complete. I give the entire staff highest praise, writing in detail all they have done for me. The food, as much as I was able to eat, has been fantastic, the staff wonderful. Every day we have discovered a different animal formed out of towels on my bed. Everyone has been especially concerned about my well-being. Omar, the chef, has been asking every day how I feel. I have been well-cared for, but so have we all. We leave a large bakshish which Mohammed says should be designated for everyone on the ship's staff. 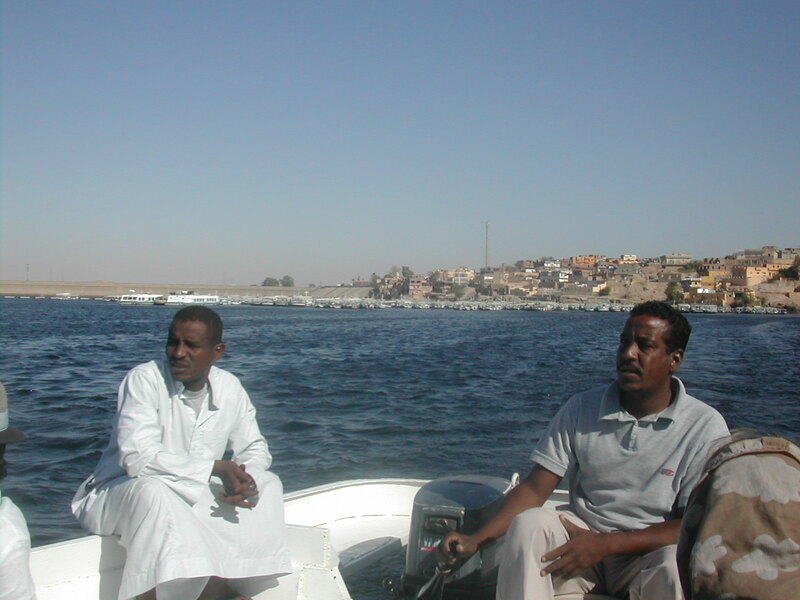 We board the bus which will take us to a motor boat, which will take us to the island temple, Philae. As we board the bus, Gottfried, the sweetest German grandpa you could ever meet, greets me. "It was a pleasure to watch you dance last evening," he says. "You were the best of them all - and I know what I'm talking about." I am amazed. I was never allowed to dance as a child - it was against our religion, I tell him. He looks at me, eyes twinkling. "Yes, I suppose anything can be abused. But this can also be a wonderful way to give thanks to God." Amen. We arrive at Philae, another temple which has been relocated because of the Aswan dam, this time to another, higher island. It gleams against the sparkling water. It has a graceful beauty, surrounded by trees on the outside, adorned with pink oleander and yellow mimosa trees in the outer courts. It is the smallest temple of all the ones we have seen. Klein, aber fein, I murmer. Small but beautiful. We stand in the outer court as the early morning sunlight warms our bodies. Mohammed begins his lecture. "This is last of the temples built exactly in the ancient Egyptian style. It was constructed during the Greco-Roman period, during the reign of the Ptolemaic rulers (282-145 BC). Alexander the Great, who was ruling Egypt before construction began, was a very influential and clever man." He walks around from person to person as he talks, resting a hand on someone's shoulder or arm, usually a woman's, as he gestures with the other. I'm beginning to notice that his hand is often resting on my shoulder or arm. Is he singling me out? I decide to make an experiment. I move backwards, more towards the center of the group. He moves, still ambling among us, hand touching person after person, until it finds my shoulder again. It rests on my shoulder for at least ten seconds before he moves on to the next person, whose arm he brushes before moving on. OK. So he needs contact with me. I like his touch. But what is it about me? It can't be my looks. I'm married, over sixty and overweight. I'm way over the hill. I think about this as I listen to him speak. "Alexander, of course, was bent on conquering the Egyptians, but he knew that it couldn't work by force. He also admired the Egyptians very much, so what did he do? He became their greatest admirer, building temple after temple in the old style, using the very best artisans. He, like the pharaohs before him, identified himself with the gods he portrayed, but he never set himself up as someone separate or apart. No, he made himself one with the Egyptians, and thus won them over." I wonder if he knows about the early Celtic Christians in Ireland, Scotland, and Cornwall, where my ancestors came from. He goes on to talk about how the early Christians took over the temple, using it as a church, claiming it for themselves, defacing the beautiful stonework with crosses. He shows how they have even chiseled away the faces of the Egyptian gods. Later people such as the French writer Balzac did one better, carving their own names into the walls. Yes, these arrogant Christians. These insensitive Westerners. It is not until after we return that I learn, while searching the internet, that earlier Pharaohs also chiseled out the faces of gods they disapproved of. They were the first temple defacers, not the Christians. But Mohammed says nothing of this. "The Philae Temple is dedicated to the god Isis," he says. "Nanzi, this is a story for you." He tells us how Isis and Osiris were siblings as well as man and wife. They had two other siblings - Seth and Nephthys." My eyebrows lift above my sunglasses. "That's right, Nanzi. But in this story, Seth is the bad guy. He was jealous of Osiris, who was a good ruler. He tricked Osiris into a coffin custom-made for him and slammed it shut, killing him." The story is a long and thrilling tale. Giovanna Magi tells the story touchingly in "Gods and Pharaohs of Ancient Egypt". In the tale, Isis finds Osiris' body, but the evil Seth gets there first and manages to dismember the body into fourteen parts, throwing them all over Egypt. I am reminded of the Bible story in Judges 19 of an Israelite woman who is gang-raped and killed. In revenge, her husband cuts her body into twelve parts, sending one part to each tribe of Israel. "There's more. Isis travels all over Egypt, seeking the parts of her beloved husband's body. She finds all but one tiny piece (his phallus, which Mohammed does not name). She gathers the parts and sings a song of love over his body, and manages to resurrect him for a time from the netherworld. The power of her love restores his entire body, and she conceives a son, Horus. When Horus grows up, he wants to avenge his father's death, but Isis interferes. She is merciful, Nanzi. Seth's life is spared." I am awed by the parallels in this story. Inside the temple, he shows us a bas-relief depicting Isis with baby Horus on her lap, breast-feeding him. "This is where scholars believe the practice of painting the Virgin Mary breastfeeding Jesus began." He finishes his lecture and heads for the café for a smoke and coffee. I rush after him. "Have you heard of St. Patrick?" He hasn't. I tell him about the Celtic Christians, who had no contact with Roman Christians. They also had no contact with the Crusaders, who used violence to spread Christianity. I tell him that people like St. Patrick and St. Columba showed the Celts the parallels to their own pagan religion, explaining about the One true God, and Jesus. They respected the customs of their people, finding ways to incorporate their culture into Christian worship, with no violence at all. They won the people over. Mohammed gives a date - fifth century, AD. Did Patrick live around this time? He's spot-on. I leave him to find Peter, but he's lost in some corner of the temple, so I walk on alone. A man walks up to me, reaching for my scarf. 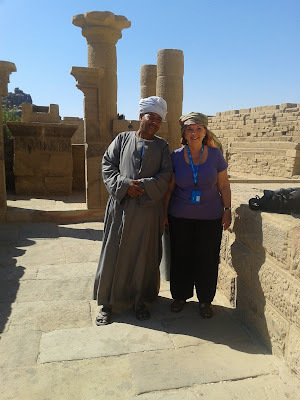 "Must be in the Nubian way," he says, and begins to wind it around my head. "Do you have children?" Yes, one child. "I have seven, but my wife died in childbirth." Ah, yes. He's asking for bakshish. I give him a tip, and his friend comes up, offering to take my picture. I grant this, paying another tip. Unable to find Peter, I walk alone back to boat. Men accost me from all sides, wanting to sell me their wares. I take shelter with another couple who arrives at the boat a few minutes ahead of time. Finally, Peter arrives, thrilled to have found the last hieroglyph ever chiseled. One of the boatman is selling jewelry during the ten-minute ride. "Six million Egyptians make their living from tourism," he says. "They, in turn, support an average of three to four people each. That makes at least 18 million people dependent on tourism." Peter buys me a beutiful red camel-bone necklace. 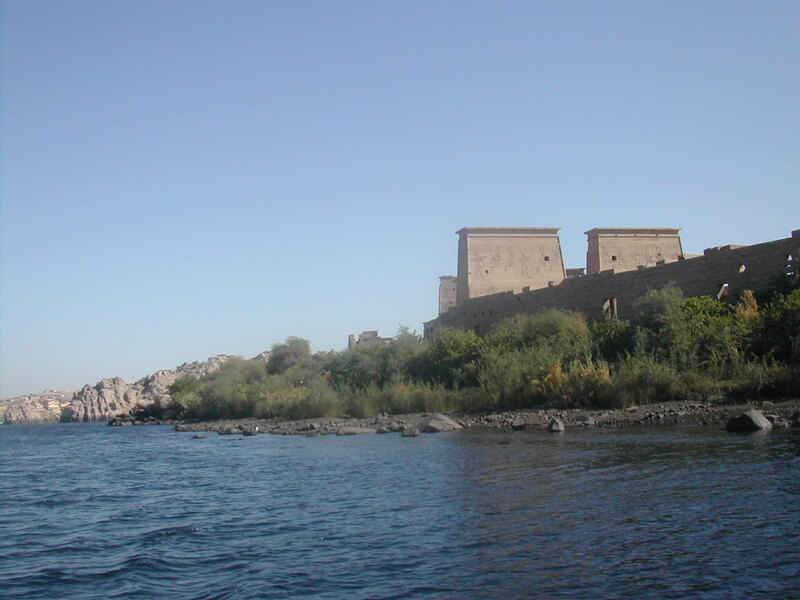 We arrive at the bus and drive on to the Aswan High Dam. Mohammed tells us about the Suez Crisis and the construction of the dam. In his version, Israel is not the real villain - it is the US - I hope you're not offended, Nanzi, but it was this way - who stopped funding the project midway, forcing Nasser to turn more and more to the Soviet Union. In his story, Nasser is a hero. I grew up hearing that Nasser was a Communist who hated Israel. Peter whispers to me as Mohammed lectures on the bus, "Have you noticed how little he talks about Israel or the ancient Israelites? It's as though they hardly existed." I have. But I like Mohammed anyway. "I think Mohammed likes me," I whisper back. "I wonder why. Is it my faith? Is he attracted to my spirituality? To the Christian in me?" "You're wonderful," Peter answers. "Who wouldn't find you attractive?" Peter has always adored me. I don't understand this, or Peter's response, but I hold his hand as Peter strokes my hair. I learn about the advantages and disadvantages of the dam. The reservoir is now the world's largest, over 500 km long and over 35 km wide at its widest point. 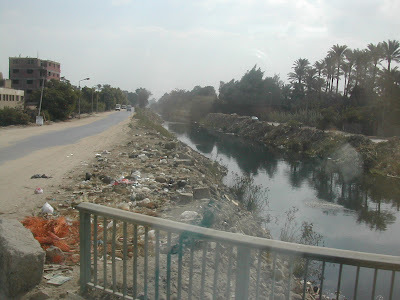 One of the big disadvantages is that, if the dam, constructed by the Soviets, but according to a German plan, should break, all of Egypt would be flooded within a day, destroying the entire country. It's midday. We pile out of the bus at the Aswan Airport. We're off to Cairo, where we will spend the remainer of our time. It's around 4 pm when we land in Cairo. Rush hour. We climb onto another bus. "There is always heavy traffic in Cairo," Mohammed says. "This is, after all, a city with somewhere between 15 and 18 million inhabitants. I've chosen a ring road around the city which will, hopefully, not have so much traffic." 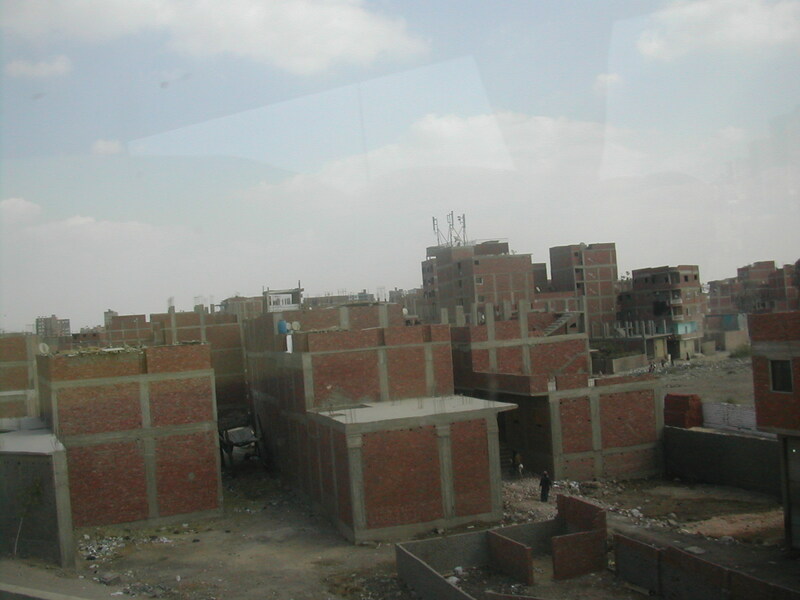 Our hotel is outside Cairo. Everything west of the Nile is officially Giza, we hear. Our hotel is not far from the pyramids. It starts out well. We speed past modern, pleasant-looking housing developments. Mohammed tells us he lives in one of these. We see signs along the motorway, advertising more housing developments - in English. But before long, even this motorway is hopelessly clogged, and a ride that would ideally last less than 45 minutes takes over two hours. Two hours to look at the scenery. We are appalled. It looks like a war zone! Building rubble on the roofs. People living in gaping, half-constructed apartment buildings with bricks falling out, surrounded on all sides by other half-constructed buildings, each of them so shabby, it looks like they'll be falling apart before they're even finished. Garbage piled on roofs, along the road, sometimes meters thick. We see goats living on the roofs of some of the buildings, children playing in hovels where their fathers pollute the air outside their homes with toxic wastes emitted from their work. Dust everywhere, hardly a tree in sight. Cairo is mostly dusty desert. We pass a canal so full of garbage, there is hardly any water flowing. We see what appear to be dead dogs lying in one of the garbage piles. One of them moves his head. There is smoke rising from some of the garbage piles. Despite the air conditioning, the air is acrid and I am having difficulty breathing. This is shocking. This must not be. Is this the fruit of Islam? "It is not the relgion that you should blame," says Mohammed. "It is the people. People are dumb. And the government we recently had. They have done nothing for us, no controls, and this is what has happened." I have never seen anything so depressing. We arrive at the hotel after dark, spent, shaken. It is opulent, occupying acres of a beautifully landscaped park. It feels disgraceful to live in such luxury after what we have just witnessed. "I feel sick," says Claudia. It's almost dinner time. We are in a five-star hotel. We will live like pharaohs.